Gear up for the best protection against Mac data loss that you’ve ever experienced, with Stellar Data Recovery Professional for Mac Version 9.0. The power-packed latest version of the software offers you an incomparable range of features and benefits making it the ultimate Mac data recovery product of 2018. Key highlights of Stellar Data Recovery Professional for Mac V9.0 include improved ‘deleted file recovery, seven international language support, SMART Drive Monitor, improved ‘Deep Scan’ capabilities, complete support for APFS file system, UI changes, customized scanning options to recover selective data or all types of data, online help, and many more. Let us visit all these features in detail here. 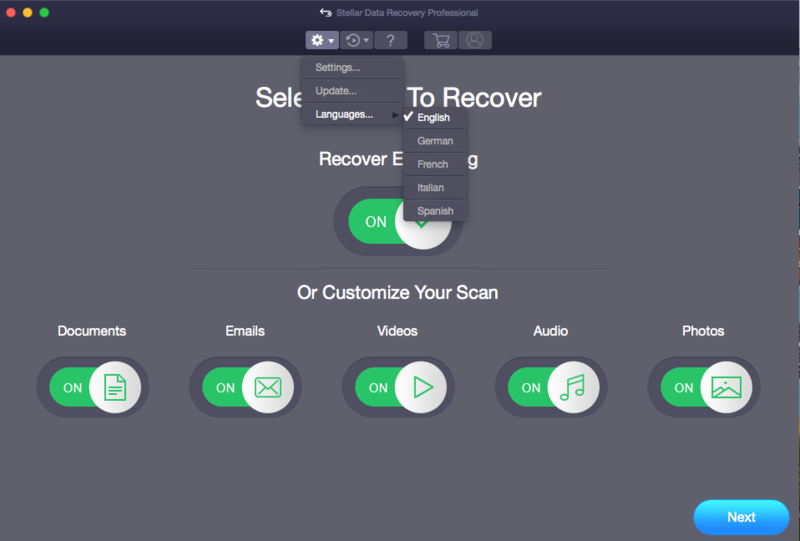 Stellar Data Recovery Professional for Mac V9.0 performs risk-free and accurate recovery of all your critical Mac files including documents, emails, videos, audios, and photos.The software allows you to customize exactly what kind of data you wish to recover through convenient toggle buttons that can be switched to “On” or “Off” state. 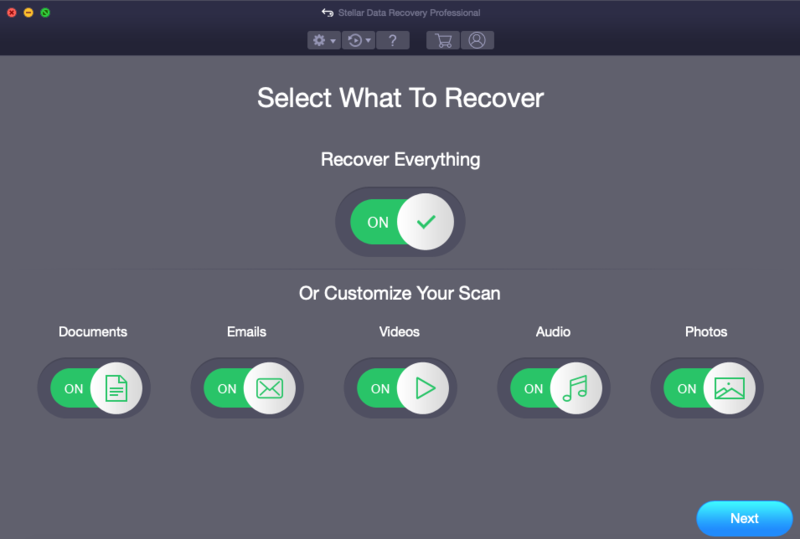 To recover all kind of data, simply toggle the “Recover Everything” button to “On” state. Regardless of whether your Mac files have been lost due to incorrect “Empty Trash” operation, a permanent Delete key combination (Command + Option + Shift + Delete), or due to other more complex issues like system file corruption or accidental formatting, Stellar Data Recovery Professional helps you regain access to missing files in no time. This version of the software provides global users with seven international language support. Now you can install the software in English, German, French, Italian, Spanish, Japanese, or Chinese according to your language preference. Not only this, even if you do not select the language of your choice at the time of installation don’t worry you can change the language at your will using Advanced Settings. The wizard’s language is changed to your preferred language and next time when you open the software the wizard will run in the last chosen language. Are you wishing to monitor the health of your storage drive? Don’t worry this version of the software is packed with the most important enhancement in the history of Stellar Data Recovery that is the provision of Drive Monitor as an innovative functionality. Drive Monitor uses SMART (Self-Monitoring, Analysis, and Reporting Technology) that is present on the storage drive to dynamically check the health status of the drive. 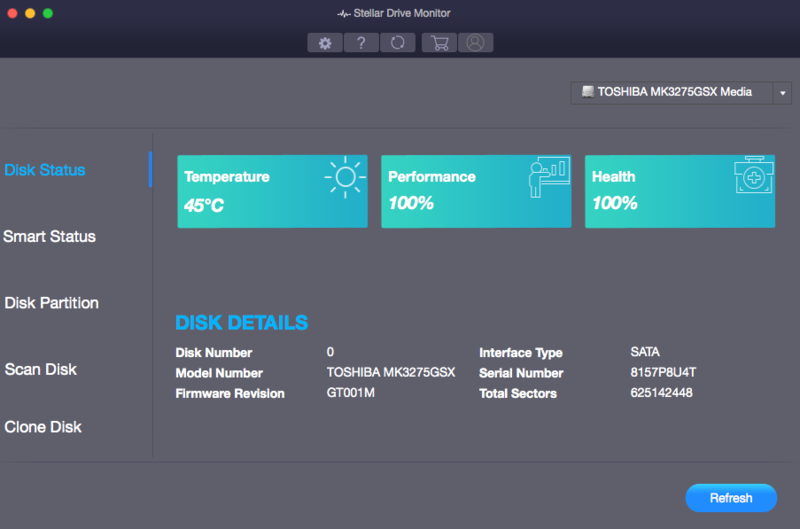 Using the Drive Monitor, you can know the temperature, performance, and other storage drive attributes. Even you map the storage drive for good and bad sectors. Besides, the most important functionality incorporated in the Drive Monitor is cloning, which allows you to clone the entire storage drive to some other external storage device. 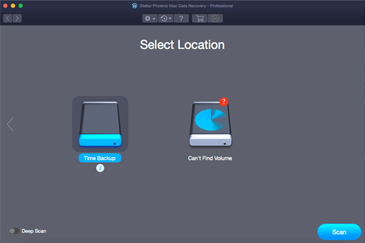 A failed Time Machine backup drive could make you lose access to all your saved Mac backups. Insure them today with Stellar Data Recovery Professional. With improved capabilities for ‘Deep Scan’, this utility enables you to pull off all recoverable data from internal/external storage drives, memory sticks, USB flash drives, and other storage media. If your Time Machine backup drive has been affected due to severe file corruption, then that’s not an issue for this powerful product; with extended support for Apple Time Capsule (recovery from sparse bundle disk image), Mac data recovery software is just the savior you need. Are you running short on time? Scan storage media once and perform customized file recovery multiple times. 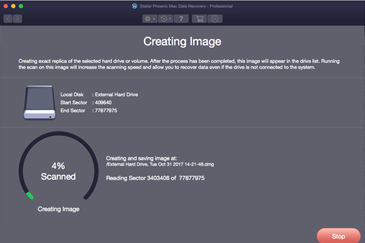 With Stellar Data Recovery Professional, you can initiate a Quick or Deep scan on any media and when the scan completes, you can save the scan information on your Mac storage drive. This file can be loaded into the software to resume data recovery at any later stage. 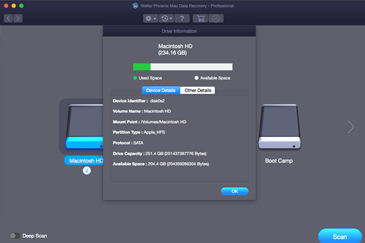 Are you worried that your Mac storage drive is falling prey to bad sectors? Protect the data on the remaining sectors before they are damaged too, by imaging your Mac storage drive with Stellar Data Recovery Professional. 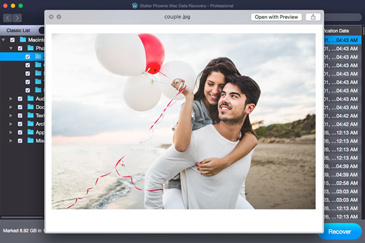 The “Create Image” feature of the application allows you to create and save a sector-by-sector mountable image of your entire storage drive or selected sectors. The storage drive image is saved as a DMG file on the specified storage location. You need to select “Load Image” from the main interface then scan and recover data when needed. 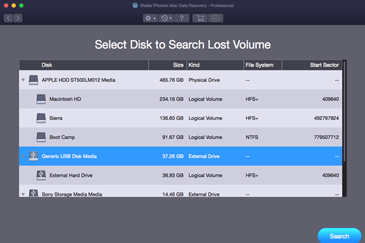 Mac volume loss can happen without warning owing to damaged partition table, virus/malware infections, incorrect formatting operations, or mistaken deletions. If your Mac volumes go missing, you could lose access to all data stored on them for good. Stellar Data Recovery Professional helps you detect APFS, HFS+, FAT32, ExFAT, and NTFS volumes easily and further enables you to recover lost data from them. You even get access to large fragmented data recovery support for lost HFS+ volumes. Preview of recoverable data was never this fun. The latest version of Stellar Data Recovery Professional includes the file preview feature. You have the choice of viewing a running preview of recoverable files as and when they are discovered during scanning or skip it via the ‘Turn On/Off Preview’ toggle switch. Further, once the scan completes, you can arrange recoverable data in Classic List for original tree, File List for category extension, and Deleted List for deleted data as well as RAW data and preview individual items from these lists. If there were an award for the most user-friendly Mac data recovery application, this product would win it easily. Version 9.0 of Stellar Data Recovery Professional comes laced with more user friendliness than ever before with vertical slider for connected volume to minimize clutter, online help for product information (which replaced the previous .chm help), change of icons for better visibility, and much more. To top it all, Stellar Data Recovery Professional is fully compatible with macOS Mojave 10.14 and all previous Mac OS versions up to 10.7. Moreover, it has complete support for APFS files system the latest renovation of Apple in its file systems. With Advanced Preferences like Add/Edit File Header, Saving Filters, Online Activation, etc., this is a must-have product for all Mac data recovery seekers.